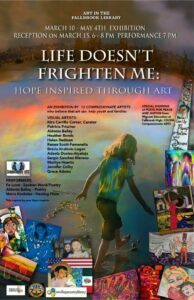 We invite you to the new exhibition, hosted by Fallbrook Library Arts, titled Life Doesn’t Frighten Me: Art, Life and Hope March 14 – May 3 , opening reception March 15, from 6:00 to 8:00 pm based on a poem by Maya Angelou. This exhibit brings together stories, photography, paintings and fabric art from the perspectives of 12 artists; Kira Carrillo Corser, Patricia Frischer, Aldonia Bailey, Heather Hillard-Bonds, Helen Redman, Renee Scott-Femenella, Brecia Kralovic-Logan, Adeola Aiyeloja, Sergio Sanchez Mereno, Marilyn Huerta, Jennifer Colby, and Grace Gray Adams who work to help kids and youth, plus Posts for Peace and Justice collaborative artwork created with professional artists and 40 students from Fallbrook High, CSUSM, Los Angeles and San Diego. There will be a special performance by Fe Love, a Los Angeles award winning spoken word artist at 7:00 pm, a jazz poem by Aldonia Bailey and a flute song by nationally known composer, author, Maria Kostelas. Compassionate ARTS in Action brings together artists and communities concerned about social issues. For example, teen suicide is soaring and Black and Brown youth teens currently have the highest rate of attempted suicide. This exhibit brings together stories, photography, paintings and fabric art from the perspectives of 12 artists who work to help kids and youth, plus collaborative art created with artists in this show and 40 students from Fallbrook High, CSUSM, Santa Monica, Los Angeles and San Diego.